While Not Your Quintessential Comfort Food, This Potato And Pork Pie Will Win You Over In Just One Bite! When we think of comfort food, we first think of things like macaroni and cheese, or chicken noodle soup, but this dish is a new contender for when we need a little pick-me-up. Whether it’s the deliciously seasoned pork or the creamy chickpea potato mash that tops everything off, this meal hits all the right notes and we can’t wait to make it again! 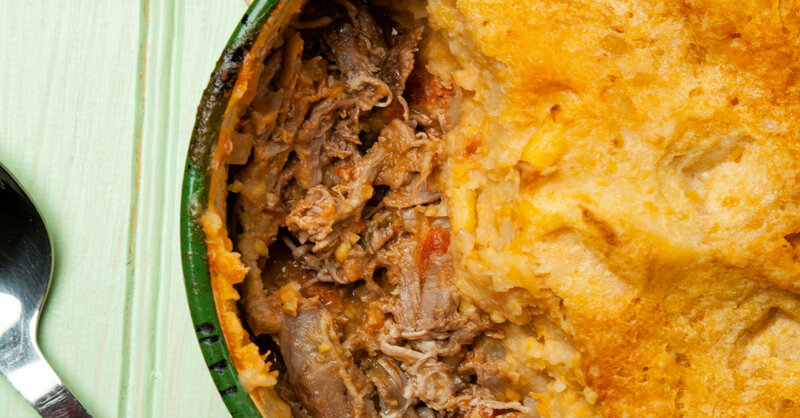 Give your shepherd’s pie recipe a break and give this one a shot…we know you’ll love it! In a small bowl, whisk together 2 tablespoons olive oil with a generous amount of salt and pepper. Rub seasoned olive oil all over your pork and place it in a large roasting pan. Cover with foil, then place in oven and bake for 3 1/2-4 hours, or until meat is falling off the bone. While pork is cooking, place potatoes in a large pot of salted, cold water and bring up to a boil. Cook for 18-22 minutes, or until potatoes are fork tender. Drain potatoes and return to pot, along with chickpeas. Add butter, garlic powder and salt, and use a potato masher to mash potatoes and chickpeas to desired consistency. Stir in heavy cream and set aside. Heat remaining olive oil in a large skillet or Dutch oven over medium-high heat and sauté onion until softened and translucent. 5-7 minutes. Add minced garlic and cook for another 1-2 minutes, or until fragrant. Season with paprika, cumin, chili powder, cinnamon, salt and pepper. Place shredded pork in with the seasoned onions and stir in tomatoes, raisins (if using), chicken stock and honey. Bring mixture up to a boil, then reduce heat and let simmer for 10-12 minutes, or until sauce has thickened. Transfer meat and vegetables to a 9×13-inch baking dish, then smoothly spread mashed chickpea potato mixture on top. Place in oven and bake for 35-40 minutes, or until casserole is heated through and the top is just browned.